Our tailor is certified by the City and Guilds of London. Alterations can be made for both men's and women's garments. Wedding gowns and prom gowns are a specialty of ours. Your clothing will be custom fit to feel like they were made just for you. We also offer custom making for suits and other needs. Please call for with any questions you may have. Our Master tailor specializes in Wedding gown alterations, which is just one way to make sure your wedding is perfectly customized for you. 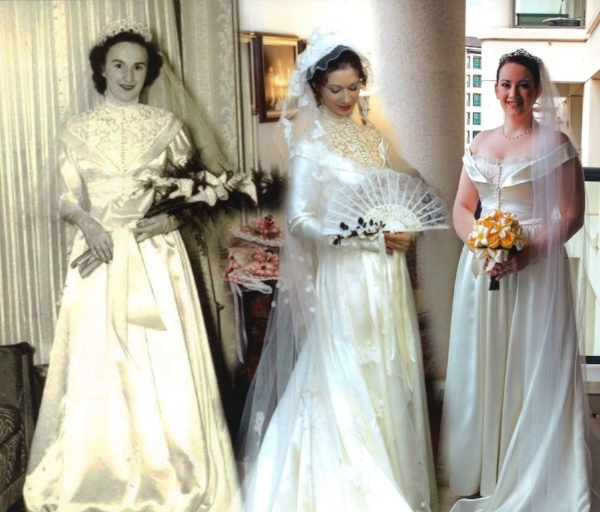 Seen here on the right is a grandmother, her daughter, and her granddaughter, respectively, all wearing the same wedding dress. Our Master Tailor was honored to be a part of this growing tradition and alter the dress for each lovely bride. He did so in a way that allowed the personality and preferences of bride to shine through, while still preserving the original dress. We can turn your traditional fitting tuxedo into a slim fit! Slim fit tuxedo are narrower and fit closer to the body. A very popular style nowadays, our master tailor can alter your traditional fitting tuxedo or suit and make it look fitted and brand new! Call us for more details and check out our tuxedo selection for more slim fit tuxedo options!